01:28—Do you have friends? They might want to know about this. 03:08—Dave Ramsey’s Smart Conference is coming in November. 04:00—Calling all small groups—we have something for you, too! 07:29—The Illumination Project is for young and old-er people. 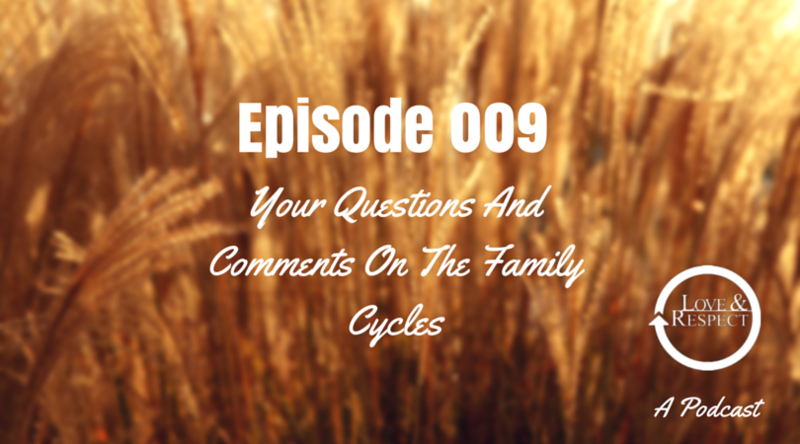 09:15—Review of the three cycles in the Family Book, starting with the Family Crazy Cycle. 11:04—Zero to Crazy in 18.2 seconds. 11:29—How do we get this baby spinning in the other direction? 14:25—How do parents remain a team throughout this whole process? 16:40—Emerson unpacks the Family Rewarded Cycle. 19:32—This isn’t about your children or their behavior—good or bad. 21:15—“Son, I love you even if you don’t take a shower”…I was amazed it worked! 27:50—The question every mother of teenage boys needs to ask. 28:44—My six-year-old disrespects me…and it often makes me respond in an unloving way. 30:00—My response is my responsibility. 31:11—I want a family full of laughter and love, but I don’t feel like my husband is leading us there. 33:23—Are you focusing on the snapshots or the whole movie? 35:14—Emerson issues the Relationship Challenge for the week. 37:55—Where we’re going from here on the podcast—we want to hear your ideas! Join us and invite a friend (or 20) to a Love and Respect Live Marriage Conference near you this fall! Emerson and his daughter, Joy, will be joining Dave Ramsey’s “Dream Team” at the Smart Conference on November 1. Space is limited. Register today. Small group materials for every age and stage and group size are available in the Love and Respect Store. The Illumination Project. Don’t settle for the status quo. Ask Questions. Get Answers. Together. Unpack the principles in Love & Respect in the Family— buy the book in our online store. Download chapter three in Love & Respect in the Family for free! Do you have an idea for the show or a question for us? Email us at podcast@loveandrespect.com. Online video streaming of the Live Conference is coming soon. Be among the first to be notified—sign up HERE.